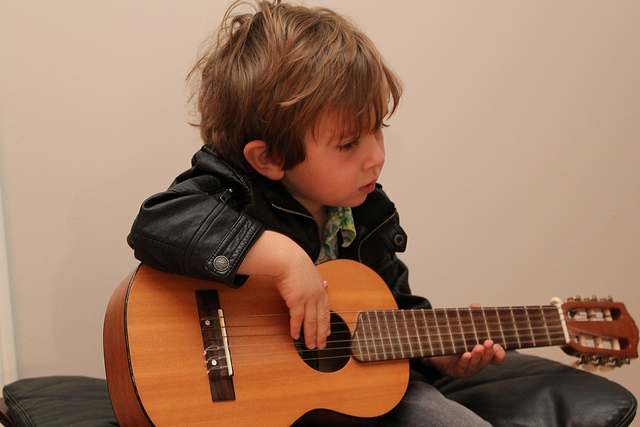 If you have been thinking about teaching your child to play guitar yourself and aren’t quite sure where to start this is the post for you. There are some great resources around that can help you teach your children to play without having to shell out for costly music lessons. Here are some of the best books, free online lessons for kids, DVDs and software to help get you started. What age can kids begin learning? It depends on the child. If your child has shown an interest in learning to play, there are lots of great ½ and ¾ size instruments (both acoustic and electric) for very young children. If you are teaching your kids yourself you will want to make sure they want to learn, they are able to sit and concentrate and they have a guitar that is an appropriate size for their age. If they are playing something that is too big it will make it very difficult for them to play comfortably. Many introductory lessons for kids follow the same basic outline listed below. If you don’t play yourself, skip down to the free lessons listed in the next section, both cover most of these topics. Go over all the parts of the instrument with your kids. Explain to them what everything is called and what it does. Show your kids how to hold the guitar. Where should their hands be positioned and how to hold and use a pick. Pretty basic, but you want to get this right at the beginning. Tuning- Show your child how to tune the instrument. This might be a little intimidating for some kids, but it is a skill that they need to learn and again there are lots of great videos online about how to do this with or without a tuning machine. Explain what chords are, why they need to learn them and show them how to read chords. Once they understand chords, you can begin to teach them simple songs. Little Kids Rock put up some handy free online lessons for kids that you can check out. The instructor goes through some of the basics including tuning, and some of the chords. Little Kids Rock is dedicated to making sure every kid gets a first-rate music education, so they have lots of really good free resources that you can take advantage of. This organization is supported by a tonne of huge names in music like Metallica, Slash, Steven Van Zandt, Lady Gaga, the list goes on and on. Kids Guitar Zone has lots of free lessons that go over everything that kids need to learn to get started playing. Lesson 1 alone has videos on: parts , the proper holding position, tuning, how to read tablature, and how to practice. It’s a fantastic, well organized site that is super useful for parents and kids. Kid’s Guitar Course, Book 1 is a method book for kids ages 5 and up. Apparently it is the number one selling kids method book. People like it because it uses simple language that kids can understand and it has a few different cartoon dogs and an alligator (who likes the blues!) It goes over how to play cords and melodies and how to read music. It also includes a CD. This is a great choice for parents who are looking for a beginner book to teach kids at home, since it covers all the basics and you the CD and DVD that are super helpful. Another very popular beginner book is Guitar for Kids for Ages 5-9 (Hal Leonard Guitar Method. It is an easy course that teaches children to play quickly. It has lots of sixties songs that your kids might already know like Yellow Submarine, I’m a Believer and Hound Dog. This method is good for electric or acoustic and is also okay for teacher or parents, even if they’ve never had any musical training themselves. The CD that comes with it contains more than 30 tracks for demonstration and play-along. My First Guitar: Learn To Play: Kids by the very prolific author Ben Parker is a very kid friendly introduction especially for parents with no musical background. The lessons cover: how to hold it, how to use a pick, tuning, chords and strumming, how to read chord diagrams. Then it shows kids how to play some of the childhood favorite songs like Wheels on the Bus, If You’re Happy and You Know It, Old MacDonald had a Farm, etc. If you are looking for a bit more instruction or a more complete package type course, there are a few around that are good for beginners. Kid’s Guitar Course Complete This course for kids has a book, enhanced CD and a DVD and it is for teaching the basics to 5-9 year olds. It also contains activity worksheets to help learn how to read music. My Guitar is a decent DVD that has an animated character named Gary, who helps children go through through over 50 lessons written by a professional instructor. This DVD goes over all the basics, like how to hold and tune the instrument, it also shows kids how to strum chords, read tablature, and also goes over how to play a few simple songs. The DVD includes a link to a bonus download tool kit wih an automatic tuner, metronome, chord dictionary, and digital recorder that can be used on your computer. Rocksmith is a learning music game that is designed for adults, but some older kids might find it a good tool to help them learn. It is kind of like Guitar Hero, but you use a real guitar that you plug into the game console using a cable that comes with the game. I’m not sure what would be the youngest you can go with Rocksmith, probably no younger than 10 years old depending on the child. My nine year old just couldn’t get into it but I have seen reviews and comments where people have said they had kids ages as young as 8 playing it. Some of the lyrics are a bit PG-13 so it isn’t for everyone. The game has over 50 rock songs to play along with, along with as well as lessons and mini-games. 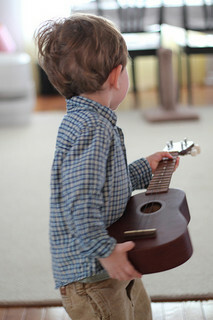 The small size of the ukulele makes it the perfect first instrument for most children. In recent years ukes have gained popularity, particularly in schools, as a great instrument to help develop kid’s musical abilities. They aren’t very hard to learn, are relatively inexpensive and are super FUN! So here’s our little guide for getting you going if you want to teach your child to play this fantastic instrument. What is a good starter ukulele for kids? If you haven’t chosen an instrument yet, you might want to start on a soprano uke. Soprano ukes are the smallest size of ukulele, the other sizes being concert, tenor and baritone. Music teachers often recommend this one from Kala, people like them because they are built well, are reasonably priced and sound really good. Since we are talking about kids, color can be an important factor when making a purchase, so another highly recommended uke for kids is the Kala Makala Dolphin Soprano Ukulele, it comes in something like eight colors and kids will really love the look of it. It’s also generally regarded as one of the best starter models around. If you are thinking about getting a toy store brand starter pack, please consider going to a music store and having a look there first. Music store brands are only slightly more expensive than toy/big box store brands, but they are worlds apart as far as quality is concerned. If you get your child a bad quality instrument it will be harder for them to play and less likely that they will stick with it. 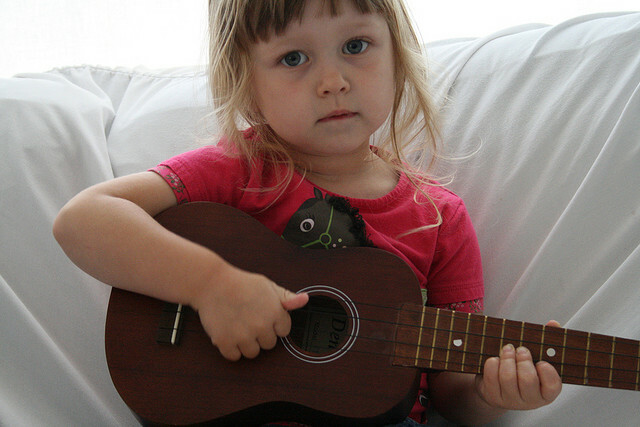 What age can children start playing ukulele? The best age to begin a child on an instrument is when they show an interest in it. 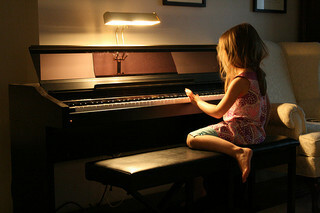 If you try to force a child to learn an instrument they have no desire to play, you won’t get very far especially if you are teaching them at home. You can try to spark an interest in playing by showing kids different models at music stores and letting them play, or showing them online videos of other children playing. It is possible for kids as young as age 3 to learn a musical instrument, but a good starting age for ukulele is generally age 6 and up. What are the basic skills to start with? If you are teaching your kids at home, start with the easy stuff. Go over the parts of the instrument. If you aren’t sure about the parts here is a good article and diagram on what is what. Show your child how to hold the ukulele. Tuning –Knowing how to tune your instrument is pretty important. There is a simple quick video here on how to do that. Ukulele 4 Kids has a ton of resources for kids who are learning or thinking about learning to play. It has great info on how to do A,C,F and G chords. The site also has reviews on Software, books, DVDs an links for songs and videos. Ukulele in the Classroom this site is primarily for music teachers but it does have really good free, supplementary materials and teaching aids for classroom use that can also be used at home if you are really keen. My First Ukulele For Kids: Learn To PLay: Kids is one of the newer intro books for kids written by the very popular music author Ben Parker. It covers basic info about the including its parts and a bit about the history. It gives practical lessons on using a pick, tuning and chords and strumming. There is also information on how to read cord diagrams and how to actually play the chords. It is written in a very simple way that children will have no trouble following along with. Kid’s Ukulele Course 1: The Easiest Ukulele Method Ever! is a method book, CD and DVD combo that can help kids learn to play songs right away. This set comes with the book, CD and a DVD that covers how to hold the instrument and tune the strings. It also shows kids how to strum chords, read music, and playing songs like Ode to Joy, Over the Rainbow, and When the Saints Go Marching In. The DVD teaches kids how to play along with notes displayed on the screen and the CD and DVD gives kids a reference on how the notes are supposed to sound. Jiminy Kokopo’s Ukulele Sing and Strum Fun Book This is a fun and educational music book, it doesn’t take itself too seriously so it’s a good choice for kids. It covers everything a beginner player needs to know including history, diagram of the parts, how to hold it, strumming, and tuning. Fun Book combines the fun of ukulele playing with theory. Kids will really like the crazy potato comics. Mel Bay presents Children’s Ukulele Method Book/CD Set by Drew Andrews is an older method for children and beginners. Since it is put out by Mel Bay you can expect a pretty standard method book covering all the basics like how to read the notes, proper holding technique, strumming and picking and lots of popular songs. This isn’t my favorite of the method books, I find it a little dry so I wouldn’t put it as my first choice of books to get, but if you like the Mel Bay style then definitely check it out. It does come with a CD that has the songs that are in the book. Ukulele for Kids – Hal Leonard Ukulele Method Series is another good option if you are looking for a method book that you can use at home to introduce your kids to the ukulele. There are lots of songs that parents will know maybe not so many that kids will recognize like Yellow Submarine, This Land Is Your Land, Rock Around the Clock, You Are My Sunshine, and Barbara Ann. This book comes with a CD that has tracks for demonstration and play-along. Some of the lessons are: parts of the uke; holding the instrument; hand position; reading music notation and counting; notes on the strings; C, F, C7, Am, G, B-flat, and Gm chords; strumming and picking. Motleumuse this is great little series of lessons from a school music teacher. Madeline’s Ukulele Class talks about the parts of the uke, how to tune it with an electronic tuner, how to play in the fret, the c chord and how to strum. Ukulele Lesson for Kids this guy goes over how to tune the uke and how to play the c chord. We all know that piano lessons can often be very expensive, so we thought why not try to find out what resources are available to parents who would like to teach their own children how to play at home. Thanks to the internet and technology in general, there is actually a fantastic amount of tools that parents can use to guide their children and help them learn this wonderful instrument without having to spend a lot of money on lessons. Is it possible for parents to teach their kids at home? Of course the ideal is to have a music teacher, but for some families taking formal lessons is not possible due to cost or location. If parents are motivated to help their children learn and kids are willing to practice and put in the work, there is no reason that a child won’t be able to learn the same basic theory that young children who are taking introductory classes are. How much will learning to play the cost? The cost can vary quite a bit, there is the initial cost of an acoustic or a digital piano (if you don’t already have one) as well as a stool or bench. If you are purchasing a digital keyboard you will also need to get a keyboard stand. It would also be useful to invest in a few good method books, as well as an online software method that you can get for a range of different prices. What age should children begin to learn? It is possible for kids as young as age 3 to begin to learn to play. Although most teachers won’t accept children for lessons until they are at least 5 years old. At age five childrens hands are big enough to play the keys comfortably and they are developmentally ready to sit still and concentrate. So five is probably a good starting age, but you can obviously start much later depending on what you think your child is capable of. 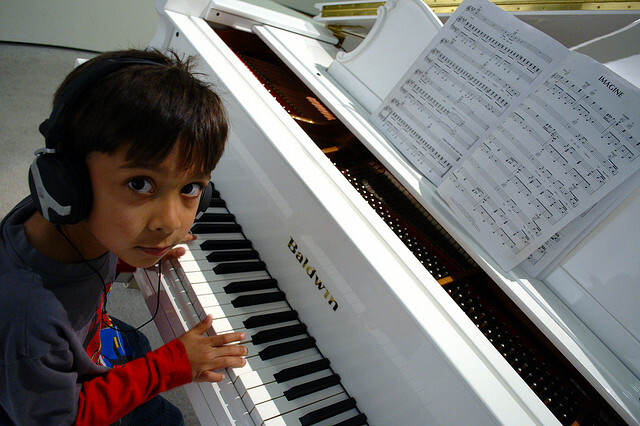 Should kids learn on a digital or an acoustic piano? If you already have one or can get your hands on one, an acoustic is the better option for kids to learn on. However, realistically most kids these days learn on a digital. They are cheaper, take up less space, and are more portable. For those parents who have their heart set on getting an acoustic and you want to buy new, you will be looking at a starting price for an upright piano at about $3000. If you are willing to look at used instruments you can get them for much less. Check Craigslist and Kijiji and also ask family and friends if they have a piano that they aren’t using and might be willing to lend, give, or sell to you. If you don’t have a player in the house, a piano can be a bit of a burden for some people, so you never know. Parents who have decided on getting a digital should look for an instrument that is as close to the feel of an acoustic as possible. To do this you need to get a digital piano that has weighted or at least semi-weighted keys. If you are able to get a digital with weighted keys then your kids will be able to transition between an acoustic and a digital much quicker. Unfortunately digital instruments with weighted keys are more expensive than those that don’t have weighted keys, but they do come the closest to the feel of an acoustic. If you live near a music store it is a good idea to try out a few different models to see what suits your child, as well as getting a feel for how the keys are weighted. Any families that are using an acoustic will need to make sure that it has been tuned before starting your lessons. You will also need to have stool or bench that are height adjustable. Sitting at the correct height will make it much more comfortable and easy for your child to learn. Your child should also know their alphabet (at least from A to G) and be able to tell you which is their right and which is their left side. If your child is very young and they don’t know right and left and their alphabet, don’t worry there are a few resources that we will discuss later in the post that are good for very young children. How much time should be spent on lessons in a week? If you are teaching your kids at home take it seriously by setting aside a particular time and day of the week for a formal lesson for half an hour. Then have your child do 15 minutes of practice a day or every other day, depending on what works best for you. Getting your kids into a good practice routine take a lot of time and disciple, but with a bit of effort your kids will hopefully get to a point that they will begin to take responsibility for their practice sessions themselves. There is no definitive method that is the best way to teach kids to play, an approach that might work for one child might not work for another depending on different learning styles. Figuring out how to start can be a bit tricky since there are a few different approaches you can take. If you would like a more hands on approach there are wonderful introductory method books that are used by music teachers but can be used by parents as well, they tend to go over note names on the staff and basic scales, finger exercises, chords, and songs. If you don’t have a strong musical background you can use educational music software or online lessons to help guide your child (see below for more info). In the last few years there has been some really interesting software and websites that have been developed that gamify music learning or have hundreds of video music lessons that seems to be following in the trend of MOOC structure that a lot of learning is heading towards. It is a very interesting development especially for families who aren’t in a position to be able to afford traditional music lessons for their kids. As with regular lessons, it takes dedication and lots of practice, but children can definitely learn a lot through some of the new technology that is coming out. Piano Marvel is a very popular music teaching and assessment software that you can use without a teacher. Students play along with the computer and receive scores that earn them bronze, silver, and gold trophies, which are placed into their own virtual trophy case. Immediate feedback is given, so that students know exactly how to improve their performance. Correct notes turn green while wrong notes turn red and show whether a note was played late, early, or in the wrong key. It combines elements of computer gaming with instrument practice. Kids can learn on their own at their own pace. It has over 3,000 songs and exercises designed to challenge everyone from beginners to professionals.Video Tutorials are provided to guide students on the fundamentals of playing; including hand positions, finger placement, dynamics, music reading skills and much more. Piano Marvel offers a 30 free trial and it costs $15 a month if you decide to sign up. To use it you need a midi keyboard that you can attach to your computer. Playground Sessions is a fairly new teaching software (put out in 2013) that has the backing of Quincy Jones. It is perhaps better suited towards an older child than Piano Marvel, but it is worth having a look at because it is a little bit cheaper than Piano Marvel. The program itself is based on a play to learn model that has students playing popular songs right away, while using the songs to teach music theory. There are also tutorials with lessons for beginner, intermediate and advanced skill levels. Some of the topics the lessons cover include keyboard skills, notation, playing by ear and rhythm. The way that the software gamifies learning to play by giving a score for how well students play on a note-by-note basis, and by song. Students can also earn badges by completing challenges. To use the software you need a keyboard that connects to your computer. You can use Playground Sessions as a member or a non-member. If you get a membership the cost is $9.99/month for 12 months (billed annually) or $14.99/month for 3 months (billed quarterly). As part of this price, you get full access to the Playground software and community, all Bootcamp lessons for free, and major discounts on songs and sheet music. If you don’t want to sign up for a membership you can still buy the Bootcamp lesson packages a la carte (prices range from $39-89) and individual song lessons and sheet music for full price ($4.49-$14.99). Synthesia is a video game and keyboard trainer for Microsoft Windows and Mac OS X, which allows users to play a MIDI keyboard or use a computer keyboard in time to a MIDI file by using falling note system, it is a little bit like Guitar Hero. You can also use it with MIDI keyboards that have illuminated keys, which can make learning easier for beginners. You can try it for free or buying a learning pack for $29. Online Classical Piano School doesn’t have any of the gaming aspects of Synthesia, Playground Sessions or Piano Marvel and it is the most like a traditional lesson. The lessons are focused on classical piano and are taught by Christie Peery, who is an accomplished solo artist. For around $30 a month you get a curriculum developed by Peery that uses video exchange lessons that teach traditional music theory concepts, sight-reading, improvisational playing and more. KinderBach is a DVD and online based curriculum designed for ages 2-7. For $7.99 a month you get access to all of KinderBach’s web lessons (over 240 sessions) by computer, iPad, Android Tablet, Kindle Fire or Nook. As well as downloaded PDF activity pages, story books, coloring pages and song books. Preschoolers will learn the keyboard characters, as well as the Grand Staff clefs, simple songs, identifying music direction, learning new rhythm notes and their beat value. Level 1 to 6 covers proper hand and finger position for the music scale, as well as staff note reading by pattern for voice, and keyboard. We have rounded up some of the best method book that are generally used by music teachers to teach introductory piano to children. The cool thing about these introductory books is that they are so simple that a parent could learn along with the child as well as teaching at home. Most of these books only provide an introduction so you will have to find another program afterwards, but these books will give a great foundation for kids who are just starting out. Alfred’s Basic Piano Library: Prep Course Lesson Level A – These very popular books are often used by teachers with their students. The lessons in the book build upon music theory not only teaching children how to play but teaching them the theories behind the music. Simple, fun, wonderfully illustrated books that are very self-explanatory at the early levels. The songs at the beginning level are silly, but they allow the student to really learn the basics. Music for Little Mozartsby Christine Barden is another very popular selection for music teachers to use with students. Parents with no musical background can use this method as it is very simple and great for very young kids. There is an app based on Music for Little Mozarts as well. Easiest Piano Course Complete and Teaching Little Fingers to Play: A Book for the Earliest Beginner by John Thompson are great beginning programs designed to be used with a child as young as four to five years old. These books combine a rote memory and note approach to playing and they have nicely illustrated pages that are appealing to young children. Zebra Keys for ages 13+ offer over 50 free online lessons. Children’s Music Workshop has a simple free keyboard lesson. Free Piano Lessons for Kids have some really good online video lessons for kids that cover everything that a paid instructor would go over with your child. 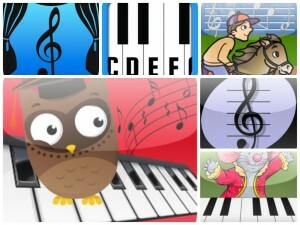 Simply Music Piano is a comprehensive learning program that includes over 60 digital lessons. 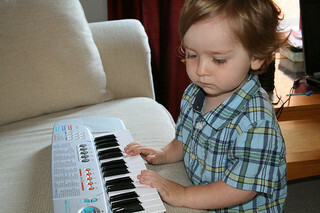 Students are given the opportunity to become familiar with the keyboard while developing a love of playing music first. As they progress, they are gradually taught how to read music at a comfortable pace. Simply music offers at-home DVD’s and also lessons taught by teachers locally. Piano for Preschoolers is a system that teaches children to read real music notes and play for ages 3-8. The beginning book containing 17 familiar beginner songs written in color-coded notes on a traditional musical staff. The basic course costs around $17 and include instant download of a 17 song music book, a 17-track audio file, a 19 lesson parent/teacher handbook, and two keyboard color strip guides (one for full-sized piano and one for mini-key keyboard). Piano for Kids at Home offers a few free lessons to try out and then you can become a member of the site for $10 a month. If you become a member you get access to more games, pictures, stories, and other fun stuff to help maintain interest in the instruction. Hopefully you have found something that will help your kids learn to play the piano, let us know if you have any good resources to add to our list. Teaching your child to read music might seem like a daunting undertaking to some parents, especially those who aren’t able to read music themselves. Luckily there are some fantastic resources (including books, apps, websites, and free online games) that you can use with your child that will teach them basic music theory and how to read notes in a fun child-friendly way. Some people compare learning to read music with learning a foreign language; to be successful you need commitment, repetition and lots of practice. Putting a bit of hard work into teaching kids music theory is well worth it because the benefits are endless. Some of the reported benefits include improving the brain’s executive function, attention, memory and focus. It also helps develop children’s verbal intelligence, reading skills and much more. Music Learning Community is a website that has hundreds of learning games of varying levels, all carefully planned to gain mastery of the elements of music theory, ear training and rhythmic skills. You can get a free 3 week trial or just try some of the games for free. Fun and Learn Music is a great website that provides teachers and parents with the materials they need to help their little ones learn basic music theory. Children’s Music Workshop has basic and more advance d lessons on how to read music and notes. Music Teachers out of the U.K have a good list of fun online music games for kids. Happy Note is another website with lots of games to help kids learn music notes and symbols in a fun way. Data Dragon has a good overview of what to learn. Probably best for an older child. Music Theory for Beginners has 22 lessons that cover all the major music theory topics from reading notes and rhythm to basic harmony. The app includes several interactive controls that make learning to read and play music fun and easy. It also has over 2,000 questions of varying difficulty to test the users knowledge. Treble Clef Kids This is the first lesson in the “Treble Clef Kids” series of music applications that can help kids learn the basics of music theory. Some of its features include exploring the piano keyboard and see the corresponding note names and location on a musical staff, naming notes and the location of the note on the staff. 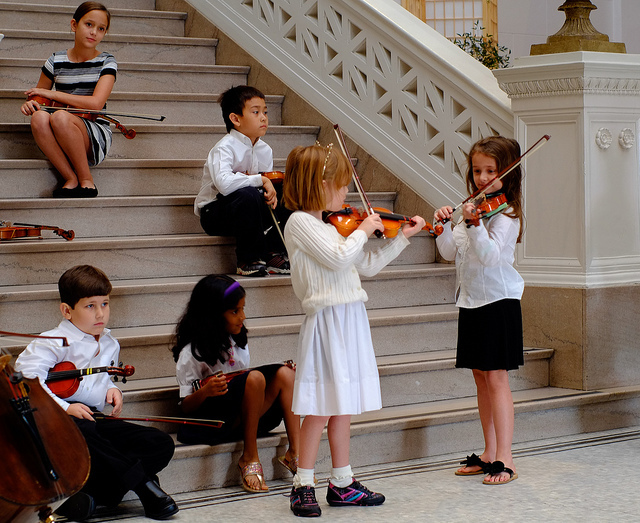 Music for Little Mozarts was developed for the preschool age group (ages 4-6). It features games that help kids learn about the piano. Notes! – Learn To Read Music is a basic flashcard app that helps beginners learn the letter names for notes on the bass and treble clef (“F” on bass through to “G” on treble). Flashnote Derby is a fun app for kids to learn and practice identifying music notes by name. The game is a horse race where the user identifies different notes in order to urge their horse and jockey on towards the finish line. Answering quickly and correctly will cause their horse to gain ground, while incorrect answers will cause it to fall behind. At the end of each race, students can review the notes they missed and see the correct answers. Treble Cat was designed by professional musicians and educators to help kids and adults learn how to quickly identify notes in the treble clef. This will help improve sight reading skills. There aren’t many music theory DVDs for children. One that I came across that had pretty mixed reviews was Trebellina Ages 1-4 Music Dvd. It’s only 32 minutes long, and if you are curious you can see a preview for it here. The DVD has an animated treble clef that leads young children through an introduction to the notes of the treble staff. The DVD teaches the note names, their placement on the staff as well as their positions on the keyboard. Doctor Mozart Music Theory Workbook teaches music theory in-depth in a fun way using a hands-on approach that involves writing notes, clefs, and musical symbols by hand. This is one of the books that mentions on its website that it is good for home schooling because everything is explained clearly and in detail so it is easy for children and parents to understand. Music Theory for Young Children by Ying Ying Ng is a series of theory workbooks for young children that incorporate clear symbols and instructions, creative illustrations, intense colour and fun learning techniques, including the use of stickers in exercises. In the first book some of the topics include: the musical alphabet (7 letter names), treble clef, time names and time values, line notes and space notes, treble clef notes (middle C to treble G), bass clef notes (middle C to bass G). 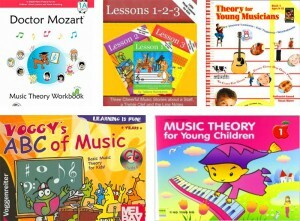 Theory for Young Musicians, Bk 1 (Book & CD) is another popular music theory series for children. Books 1 and 2 contain theory lessons, ear training lessons and worksheets. This series is designed for students from ages 8 to 12 in their first year of lessons, but can be used at home by parents. This method includes theory lessons, ear training (with CDs for books 1 and 2) and worksheets. Voggy’s ABC of Music Basic Music Theory for Kids has Voggy explaining the basics of music in a child-friendly manner. This method uses well-known children songs to help kids review and practice music theory. It also introduces the most popular musical instruments with pictures as well as sound. Theory Made Easy for Kids, Level 1 by Alfred Publishing is a theory series that is designed for children ages 4-7. It has colorful illustrations and fun musical sticker sheets in each book. Little Music Lessons for Kids: Lessons 1-2-3 by Tatiana Bandurina. You can teach your child music theory with help of the series “Little Music Lessons for Kids” even if you are a total newbie. The website for the author has a lot more info about this series. This series has stories with bright pictures and a cute musical puppy tell your little one about what the music staff is about. A few people (music teachers mostly) have put together a mix of some of the best You Tube videos that can help kids learn how to read music. Anne Crosby Gaudet put together a great selection of free videos that are helpful for learning music theory. Also this selection from MusicK8 is a pretty good roundup of videos covering lot of beginning concepts and ideas. Good luck with teaching your children to read music, remember that it won’t come quickly but with lots of patience and perseverance they will learn a great skill that will give them a wonderful sense of accomplishment. If you have any great resources for help kids learn notes and music theory please let us know in the comments below. It’s a little surprising that harmonicas aren’t more popular with kids, especially since they are sort of the perfect beginner instrument. They are cheap, easy to play, very portable, and they are already tuned to a certain scale so you can’t really hit a bad note. Harmonicas are also great because kids can learn about basic music theory and they are so simple to learn that your child will be playing a recognizable song in no time at all. So if you are thinking about getting your kids into music, but you aren’t quite ready to commit to an expensive guitar or piano, then have a look at the harmonica, because it really is an ideal starter instrument for kids. Luckily for you, we have rounded up lots of amazing resources that can help you get started. Obviously you will need to get a harmonica before you can do anything. There are a number of different types of harmonicas (or the harp as it is also known), the two most popular types being the diatonic and the chromatic. A diatonic generally has 10 holes and each harmonica comes in different keys (like C, A, B, F#, etc.). A chromatic harp has a button on the side that lets the player play all 12 keys and are much harder to play than a diatonic. So for beginners and kids it is generally recommended that you get a diatonic harp that is tuned to the key of C.
There are lots of cheap harmonicas for children available, so a good place to start is with Hohner. Hohner has been making harmonicas for the last 150 years and basically sets the standard for quality with lots of harmonicas to choose from. If you have a very young child you could get a starter harmonica. A starter harmonica has only four holes, so it makes it easy for kids to play one note at a time. 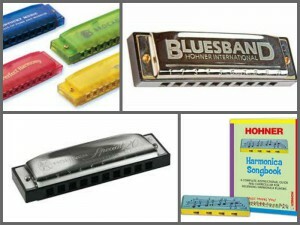 A good starter harmonica is something like Hohner Kids PL-106 Musical Toys Play and Learn Harmonica. If your child is over 5 then you should avoid the ‘toy’ harmonicas and get a good quality harp that will last for years. The most recommended harmonica for beginners and kids is the Hohner Special Twenty Harmonica, Key of C. It is a professional quality instrument for a very reasonable price (usually somewhere around $35). It sounds and looks amazing and is perfect for a beginner. If you are looking for something a bit cheaper, but you still want a good quality harmonica then the Hohner Blues Band Harmonica is the one to get. This one also sounds great and is easy to play, but has a lower price point (less than $10). Harmonica 4 Kids is Dave Gage’s harmonica lessons for kid’s website. There is lots of great info on this site including songs, tips and games. This is a wonderful resource with so much great material on it you won’t even believe it. 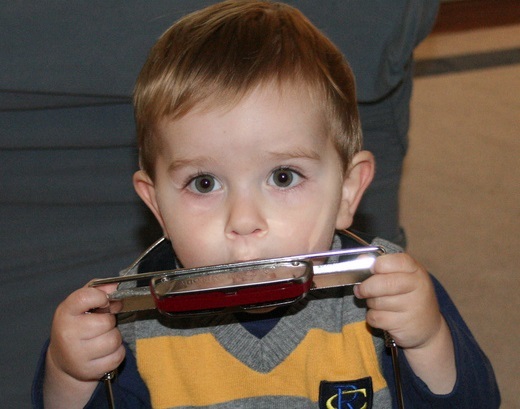 Harmonica for Children is another really good site with online lessons for kids. It also has a lot of common children’s songs that kids can play along to. Funky Nursery has play along harmonica lessons designed for younger harp players to teach kids how to play traditional nursery rhymes on a C harmonica. 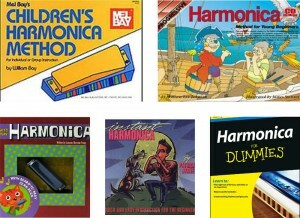 If you want your kids to learn the harmonica it is helpful to have a couple of method books for reference. There isn’t a lot of choice as far as harmonica books for children, but there are few decent ones and some books that are for beginners in general that are okay for kids. Mel Bay Children’s Harmonica Method is one of the few harmonica books that was written for children. It has step-by-step instructions and shows kids how to play Jingle Bells, London Bridge, Oh When the Saints, Pop Goes the Weasel, Camptown Races, and a few others. Voggy’s Harmonica Book Book/CD Set for kid’s ages 6 years and up. This is another book put out by Mel Bay that is designed specifically for children. It covers proper playing position, playing technique, reading music, playing single notes and whole songs. It also has all songs recorded on a CD that is included. They even included an appendix that has tips on practicing, caring for the harmonica. Let’s Play Harmonica is a set that includes a couple of harmonicas and it has short lessons that are good for kids. It also includes a Song Book with how-to instructions and 12 popular songs for your child to play. This one is very basic, made for a very young child. Progressive Harmonica Method for Young Beginners covers the basics of harmonica playing and reading music. It has lots of well-known children’s songs that kids can learn and it has nicely illustrated full color pictures as well as a CD or link to Harmonica Lessons for Kids that has the songs and exercises that kids can play along to. Instant Harmonica is one of the more popular books if you want to learn the harmonica and it gets recommended a lot. It isn’t written for kids, but with an adults help it is a good beginner book. It has a combination of tablature and EZ-Play notation and over thirty country and folk songs. Harmonica For Dummies The Dummies series of books are usually pretty good for kids when there isn’t a look of other books on a particular topic. This book gives clear step-by-step instructions and has lots of info on tips and playing techniques, how to read the notation and tablature. Hopefully you found something that will help you kids get interested in the harmonica, if you have any great resources that we missed let us know in the comments below. If you are a parent who would like your child to learn the Suzuki method and are wondering if it is possible to teach your kids some of the Suzuki concepts yourself, we have found some helpful resources. Having a music instructor is the ideal way to go if you want your kids to learn Suzuki, but unfortunately for a lot of families private lessons are not an option. Luckily there are some great online video lessons, books and websites that can be used to teach Suzuki to children. Suzuki method is a philosophy of teaching music created by Sin’ichi Suzuki. The main idea is that all children are capable of learning music from their environment using the same basic principles of language acquisition. In the same way that a child learns his or her mother tongue, Suzuki method focuses on starting a child early, listening, parent involvement, encouragement and constant repetition. Generally the Suzuki method is used with beginner violin; but you can also use it to learn viola, cello, bass, flute, guitar, harp, piano, organ, voice, recorder and early childhood education. We are going to focus on resources for learning violin, as it is the most common Suzuki instrument for children. If you would like to learn a bit more about Suzuki, there is a really nice short documentary about a Suzuki class at the Elaine Kaufman Cultural Center that gives a great overview of a lot of the concepts. An Start Early- Suzuki students generally start at a very young age, sometimes as young as two, but more typically between the ages of 3 and 5. Listening -Children will learn to play music by listening, they don’t learn to read music until much later. Parents will need to play the Suzuki CDs repeatedly to help children become familiar with the music and make it easier for the child to play. Loving encouragement- One of the more difficult principles to follow is finding ways to make practicing fun, so that kids look forward to it. Parents should praise their children frequently and try not to push them. A couple of books that can be helpful for finding creative ways of keeping practice fun are Step by Step 1A: An Introduction to Successful Practice for Violin and I Love to Practice! Kit for Suzuki Violin Book 1 . Step by Step 1A focuses on age-appropriate practice habits including listening, singing, and dancing to playing music. The CDs that come with the book include pieces from the Suzuki Violin School. I Love to Practice has over 60 practice games for Suzuki violinists and other games that parents can play with their children during practice. Parental Involvement- Parents play an active role in the learning process by guiding music practice and encouraging and motivating kids. It’s important for parents to be involved when their child is practicing each day. Repetition – Through repetition children will have to master each piece before moving onto the next lesson. They will also have to constantly go back and play every piece of music they have learned on a regular basis. Learning with other children and Performing Often – These two principles are believed to help children elevate their own skills. If you are teaching your kids Suzuki at home it will be difficult to follow these ideas unless you know other children who are also studying Suzuki method. A couple of ways to get around this is by taking your child to local concerts and listening to classical music at home to help elevate your own child’s skills. You can also have your kids perform for relatives and friends to help encourage their musical skills. Suzuki students don’t start to learn to read music until they have learned to hold the instrument well. Holding the Violin and the Bow Jason Barber has a really good video lesson for parents to show them how they can teach themselves and their kids how to hold the violin. He also has a good video on how to hold the bow properly. If you want some hints on how to make this more fun check out some of these fun bow hand games for kids. Posture – Be sure your child is using appropriate standing posture while practicing. If you haven’t already got it, you will need to get the Suzuki Violin School Revised Edition Violin Part Book & CD Volume 1 This is the first volume from the Suzuki Violin School. There are 10 volumes in total that take many years to work through. This book covers the fundamentals that you will need to go over with your child, you can use it in conjunctions with some of the free online Suzuki lessons listed below to help get through some of the more difficult concepts. It is useful to get the CD for the child to listen to. If you are teaching your child piano or one of the other instruments there are Suzuki School Editions for all of the different instruments. To Learn With Love: A Companion for Suzuki Parents considered by some to be sort of a handbook for Suzuki parents. It covers topics like supervision of practice, how to nurture a positive self-image, tradition, nutrition, and how to work with your child. Nurtured by Love: The Classic Approach to Talent Education was written by Suzuki and it goes over the philosophy and principles of his teaching methods. Ability Development from Age Zero is the sequel to Nurtured by Love that focuses on parenting and nurturing a child and why parents need to be a good role model for their kids. The McKinley School has an amazing roundup of a seventeen week Suzuki class with links to YouTube videos. Scroll down to week one. Here is a simple Suzuki lesson with a small child. Parents can use some of the same techniques to teach their own kids. Naperville Lessons has a Book 1 Suzuki Violin School lesson in two parts. It’s not an easy lesson to follow along to, as he goes very quickly. If you stop it as you go through you should be able to pick up some good tips. Red Desert Violin has an online violin school that teaches using Suzuki method. Although it isn’t a free course, you can see a free preview of one of her lessons. Suzuki Violin Lessons has a really good list of practicing and learning resources. If you would like more resources to help children learn the violin check out our post on teaching kids violin.